About a week before Christmas, I got a call from Sean, asking about my availability for his January 5th wedding at Zuma Beach in Malibu. Luckily, I was available and quickly set up a meeting with Sean and Oralia, his fiance. We met during the pre-Christmas SoCal floods and I’m so glad everything worked out. Sean and Oralia celebrated their wedding today at Zuma Beach under bright blue skies as the sun prepared to set over the Pacific. They’re an amazing couple, and I’m so glad I was asked to be their officiant. Surrounded by close family members, I led the ceremony featuring Shakespeare’s Sonnet 116, the Hand Blessing, unison vows, ring exchange and a unique sand ceremony. For their sand ceremony, Sean and Oralia scooped up sand from the beach, each using a hand to come together and create unison scoop, and dropping it into a beautiful pottery vessel. Different from the usual sand ceremony, but that made it even more special. It’s a good illustration of how any couple can adapt any part of the ceremony to make their own unique expression of love. 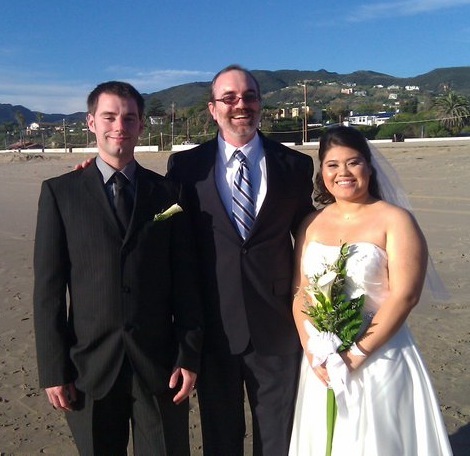 This entry was posted in wedding, wedding officiant and tagged wedding officiant, Zuma Beach. Bookmark the permalink.